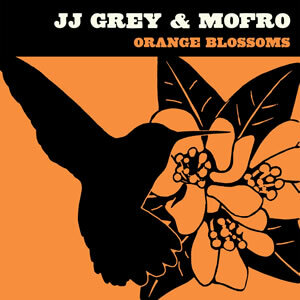 Like Florida's state flower, the orange blossom, musician JJ Grey's songs are fascinating, beautiful, and complex. Both are products of the same ground: the rich, fertile and ancient soil of the Sunshine State. Born and raised just outside of Jacksonville, Florida, Grey comes from a long tradition of Southern musical storytellers and, like the best of the great Southern writers, he fills his songs with details that are at once vivid and personal, political and universal. His multi- textured music overflows with dynamic rhythms and thought- provoking lyrics. From raw funk to deep soul, blues and rock, JJ and his band Mofro deliver devastating live and recorded performances. Debuting in 2001 with BLACKWATER, following up in 2004 with LOCHLOOSA (both albums reissued by Alligator in 2007), Grey steadily built an intensely loyal following. In 2007, with his first Alligator release, COUNTRY GHETTO, Grey reached an even larger audience, doubling both his album sales and his concert attendance. Now, with his new album, ORANGE BLOSSOMS, JJ Grey takes another giant step forward. ORANGE BLOSSOMS, produced by long-time cohort Dan Prothero and Grey, was recorded in north Florida and boasts some of Grey's most profound and moving music to date. The album features 12 songs (including 11 Grey originals) inspired by Grey's life experiences and visionary observations. With long-time friend and guitarist Daryl Hance, bassist/organist Adam Scone, drummer Anthony Cole, and the Hercules Horns of saxophonist Art Edmaiston and trumpeter Dennis Marion, Grey moves effortlessly from gospel-tent fervor to Southern-fried rockers to deeply emotional soul. ORANGE BLOSSOMS is a groove-driven masterpiece fueled by JJ's gritty, smoldering vocals and intense, funk-infused guitar and keyboard work. JJ Grey's songs blend front porch realism with the best musical and literary traditions of the South. Whether it is a narrative passed down to him from his grandmother or the tribulations of a childhood friend, Grey's ear for detail rings through in true storytelling fashion. His voice delivers with an unflinching strength that makes the personal universal and paints a vivid portrait of an exact time or place. Like his songs, Grey's rich, soulful vocals are forceful and commanding, seemingly wise and experienced beyond his years. Grey's songwriting influences are widespread. "I like people who tell their story," he says, naming Muddy Waters, Stevie Wonder, Tony Joe White, Jerry Reed, Otis Redding, Dr. John, Sly & The Family Stone, Van Morrison, Bill Withers and Dan Penn. What these writers and performers have in common is a love for simplicity and the ability to evoke complex emotions with a minimal number of words and notes. As a performer, Grey is influenced by the sexually charged blues of Howlin' Wolf, the country soul of George Jones, the hard funk of James Brown, and the smooth R&B of Donny Hathaway, as well as by local personalities like the street preachers and radio disc jockeys of his youth. In 2001 Grey's debut album, BLACKWATER, was released under the name Mofro (a name Grey conjured up while working at a local lumberyard). Soon thereafter JJ, along with guitarist Daryl Hance, hit the road hard (playing over 175 shows a year) with an ever-changing Mofro line-up. A National Public Radio feature in 2001 brought JJ's music to scores of new listeners, helping to open doors at press, radio and venues across the country. 2004's LOCHLOOSA brought Grey even more attention, as the band performed at the first Bonnaroo in 2005 and opened for Widespread Panic, Ben Harper, Galactic, B.B. King and Jeff Beck. Word of their live shows spread quickly, and offers to appear at festivals and concerts around the world increased. 2007 was a watershed year for Grey. The release of COUNTRY GHETTO brought widespread critical and popular acclaim, garnering piles of positive press with reviews and features running everywhere from The New York Times and USA Today, to Harp and Paste magazines. Commercial and public radio embraced Grey as well, as COUNTRY GHETTO received regular rotation on nearly 100 stations and was featured on hundreds more. In addition to countless live in-studio performances at stations around the country, he and the band appeared on National Public Radio's World Café, the syndicated program E-Town, and played live on the Paul Jones Show on BBC2 in the UK. JJ Grey & Mofro toured constantly in 2007. He and the band played over 120 dates headlining clubs and concert halls and performing at scores of festivals across the United States and Europe. Highlights included The Voodoo Music Experience, SXSW, The New Orleans Jazz & Heritage Fest, Wakarusa, Langerado, The Austin City Limits Festival and a Southeast run with the Allman Brothers. On Labor Day weekend 2007, Grey was able to fulfill a lifelong dream by hosting his own roots music festival, The Blackwater Sol Revue in St. Augustine, Florida. The all-day event featured Los Lobos, Tony Joe White and Florida favorites The Legendary JC's and The Lee Boys. The second annual Blackwater Sol Revue happens on August 30, 2008 and features one of JJ's favorite performers, Toots And The Maytals. From gritty funk and juke joint romps to contemplative country soul and blistering rockers, Grey's music is in a class by itself, at once contemporary and classic. Now, with his latest release, ORANGE BLOSSOMS, JJ Grey will bring his singular musical vision and hip-shaking, soulful live show to his ever-growing fan base, showing how his songs speak to people all over the world and how far-reaching his Southern roots can spread. On behalf of Exile Productions and Exile Publishing, many thanks for plugging Van Morrison and, for your readers’ info, up-to-the-minute news on Van’s latest album - Keep It Simple - and 2008 shows is, of course, available on www.vanmorrison.com and www.myspace.com/vanmorrison and, for a limited period, you can still see Van's exclusive BBC sessions at www.bbc.co.uk/musictv/van... . We’re also pleased to announce that an increasing archive of exclusive film footage of Van Morrison performances has now been made available for fans on Exile’s official YouTube channel at uk.youtube.com/user/Offic... .